Infrared heater bulb packs, purchase our low cost commercial and domestic heater bulb multi packs for big saving on cost per bulb with free next working day delivery. Here we currently offer ruby 1.3 and 1.5 kW R7 / R7S push fit and 1.5 kW SK15 wire ends in packs of ten with more including the 110 Volt infrared 1.4 and 1.5 are to be added soon. For packs not shown here please see the relevant single bulb listing and select form the multi pack options. 500 Watt Ruby Infrared Heater Bulb - Ten..
110 Volt 1.5 kW 348 mm R7 Heater Lamp..
To identify the correct replacement heater bulb for your heater please compare the overall look, length output and fitting type shown on our listings against your existing bulb, please note for the 1.5 and 2 kW SK15 elements our none jacketed tubes can be used to replace jacketed tubes. If you need any help please call us during office hours or message us. The infrared heater bulb ten packs are dispatched the same day if ordered before 3 pm Monday - Friday using a next working day fully tracked service with delivery time slot notification and collect from pick up shop option. 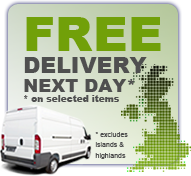 If the heater lamp bulbs are ordered after this time or at weekends the bulbs will be dispatched the next working day.